While a yacht race across the North Atlantic in December might rightly conjure up images of freezing cold, storms and other water-born misery, at present competitors in the IMOCA Ocean Masters Transat St Barth-Port la Forêt continue to enjoy shorts and T-shirts sailing in the trade winds. At 1100 local time (1500 UTC) yesterday, six of the seven IMOCA 60s competing in this scoring event for the IMOCA Ocean Masters World Championship, departed Gustavia, St Barth’s main port. In 15-16 knots of wind, leading off the line were Sébastien Josse’s Edmond de Rothschild and Paul Meilhat on SMA, followed by 2009 Mini Transat winner Thomas Ruyant on Le Souffle du Nord. While northeast may be the course back to northern Europe and the Port la Forêt finish line, this would take the boats through the middle of the Azores high where there is no wind. Instead, since leaving St Barth, they have been heading north and will press on like this until they can key into the favourable westerly winds that, in theory at least, should blast them around the top of the Azores high and on towards the Breton finish line. 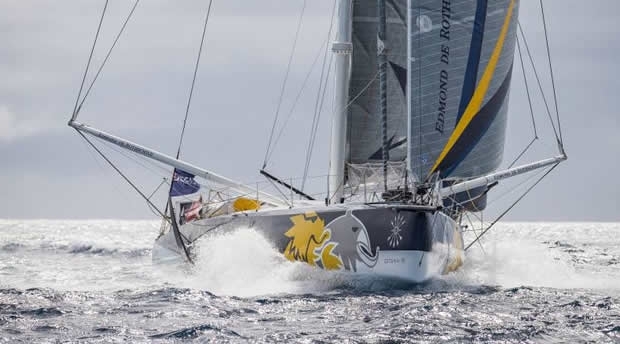 In the 15-20 knot easterly trade winds since the start there has been some variation in the boats’ headings with Le Souffle du Nord sailing slightly higher, taking her off to the right of the race track. In front, Edmond de Rothschild and SMA initially stuck together like glue, until Josse’s latest generation VPLP-Verdier design finally shook off SMA mid-afternoon yesterday as they passed east of Anguilla. Since then she has steadily extends, increasing her lead to 13.2 miles at 0900 this morning. However this trend has since halted. The boats are currently exiting the trade winds and in a rare case of ‘rich getting poorer’, the leaders are sailing into less breeze. The final starter didn’t manage to make it to the line yesterday. Irishman Enda O’Coineen’s Currency House Kilcullen went for a test sail on Wednesday to discover that her sail drive (the part that drives her propeller – necessary for safety reasons) was not functioning. “Murphy’s Law was in action: ‘What Can Go Wrong - Did Go Wrong’ seemed to be the rule since arriving in St Maarten,” O’Coineen admitted. To rectify the problem an international operation was mounted to source parts from south London then couriering them across the Atlantic to St Barts. Meanwhile Currency House Kilcullen was taken to nearby St Maarten, where there was a crane capable of raising her transom enabling the replacement parts to be fitted. “The team worked 24/7 or 25/8 to be ready - I am really appreciative of Currency House Bank and everybody for their massive support,” O’Coineen continued. Currency House Kilcullen crossed the start line at 1130 local (1530 UTC), 300 miles behind the race leader. Meanwhile the rest of the fleet is settling down for a quiet, possibly frustratingly quiet, couple of days as the skippers attempt to keep their boats going through a transitional phase in the weather during which the wind will slowly veer southwest the further north they sail.Eric Holden was expecting the new breeze to fill in on Wednesday, while Thomas Ruyant reckoned Wednesday or Thursday.